In fitting spirit of Women’s History Month, we are honored to announce some history in the making: Jill Terp has been selected as the new Deputy Project Leader of the San Diego National Wildlife Refuge Complex! Under Jill’s leadership as the refuge manager for the past eleven years, the San Diego NWR now protects and manages approximately 12,300 acres of significant wildlife habitats from mountaintops to riverine corridors. She has cultivated diverse partnerships that have allowed the Refuge to expand public access to connect our urban communities with wildlife. 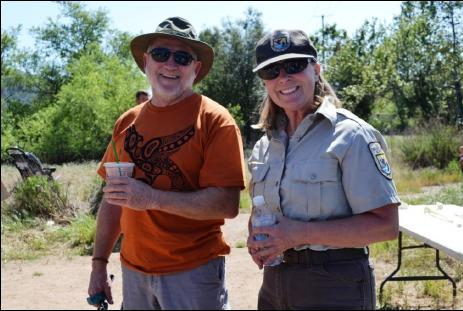 She is always involved with the public environmental education and volunteer events on the refuge and trail resign projects such as the Mother Miguel Trail. “Jill has demonstrated exemplary Refuge management by supporting cross-Refuge and cross-agency coordination efforts to manage wildlife habitats throughout south San Diego County,” said project leader Andy Yuen. Please welcome Jill as our new Deputy Project Leader! There will be a joint oversight hearing next Tuesday, January 15th, at 11:00 ET, regarding the government shutdown and its impacts on public lands. The hearing will be conducted jointly with the Appropriations Committee and the House Natural Resources Committee. We would like to enter a letter for the record addressed to House and Senate Leadership from refuge Friends nationwide calling upon Congress to pass FY19 appropriations bills and open our National Wildlife Refuge System, thereby allowing public access, refuge staff to be paid and critical habitat work to resume. It is already likely that much field work that should occur this spring and summer may not happen due to an inability to get everything in order now. To join the letter, please use our google sign on form here. And don’t worry if more than one person from your Friends group signs the letter, we will remove any duplicates. Where public access to refuge lands does not require the presence of a federal employee or contractor, activities on refuge lands will be allowed to continue on the same terms as before the appropriations lapse. Any entry onto Refuge System property during this period of federal government shutdown is at the visitor’s sole risk. Please read this important message about the closure of National Wildlife Refuge System facilities during the shutdown. The Tijuana Estuary Visitor Center and the Tijuana River National Estuarine Research Reserve are not affected for visitors.